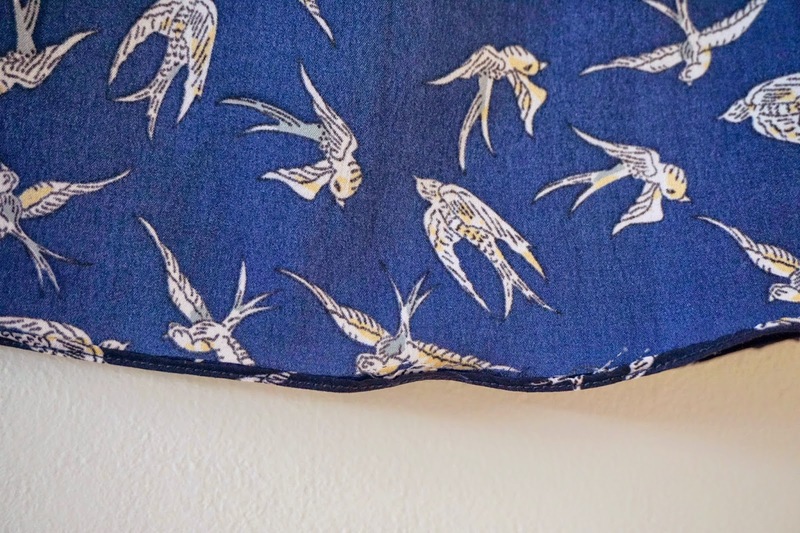 I had a tiny piece (60cm x 112cm) of swallow print polyester fabric in my stash, picked up for £2.40 from the John Lewis remnant bin. 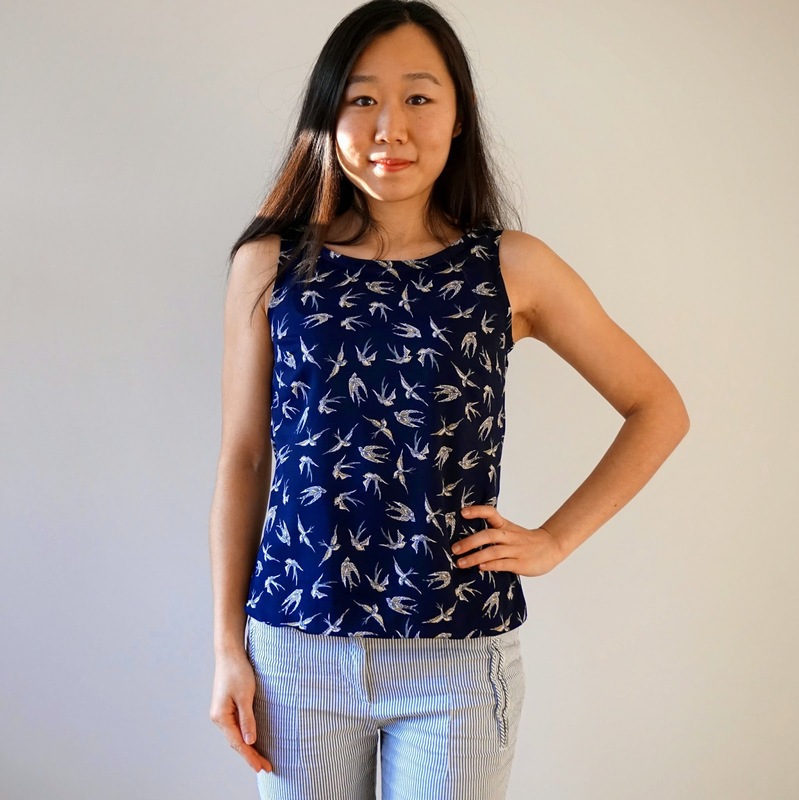 I've been meaning to make this into a little shell top, and with my recent "diversion" to knit fabrics, I fancied a quick woven project in familiar territory. As someone who really enjoys learning new tips and skills, however, I took this opportunity to try out a new technique - using a narrow hem foot. I used New Look 6483, which I have used once previously for the Crazy about Coral top. Unfortunately the shoulders on that top was a little narrow in the end, resulting in a unsightly permanent line across the shoulder, and with the spirit outlined here, also resulted in it ending up in a charity shop. That doesn't stop the pattern from being a good one, though, and this time I made view E in the graded down 2 again. I shortened the pattern by quite a bit, to allow for the narrow hem as opposed to the 5/8 hem as called for by the pattern. the other thing I tweaked was to remove the centre back seam, the back button closure, and the side slits. 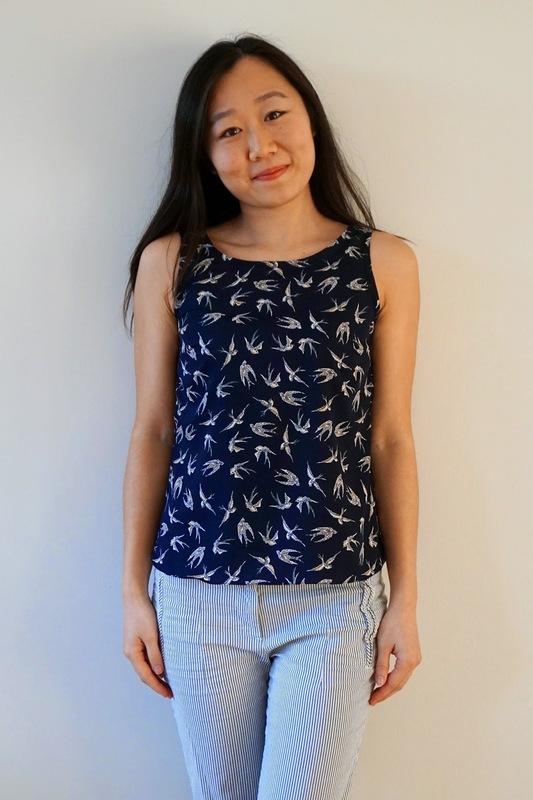 I wanted a simple shell top, with minimal break in the fabric pattern. I explored to find the right balance of tension and stitch length for the delicate fabric with my new machine (which I'm yet to introduce to you, or give it a name, but it is a complete delight to work with and we are getting on very well indeed). And the result? Not a pucker in sight! 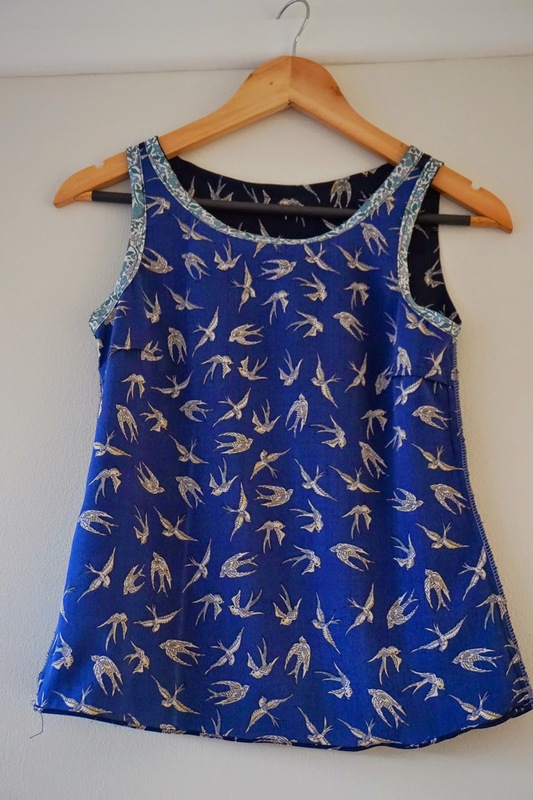 As I had very limited fabric, I finished off the neckline and armholes with a Liberty lawn bias binding using this method, and omitted the facing. You probably know by now that this is my go-to method, but I just want to say again that it's wonderfully useful for delicate fabrics like this one. Here's this little number inside out. You know, I'm so tempted to wear it this way - I love the subtlety of the blue on this side, and of course the Liberty bias tape. I'm happy to add the narrow hem foot to my family of very useful and much treasured machine attachments. I've always been amazed by how these little attachments work wonders and how much of a difference it makes -- you may remember my first encounter with the overcasting foot (much used until I got my overlocker), my excitement over the gathering foot and the button sewing foot, and my recent discovery over the walking foot. If I had to pick a favourite, at this point in time I would say it's got to be the walking foot - it has transformed my sewing completely and lowered my blood pressure significantly (who knew that "top-layer creepage" was so easy to avoid! ), and I constantly find myself reaching for it. The real question is, why did I choose to torture myself for so long before buying one? How about you? Do you have a favourite sewing foot for your machine that you wish you bought years ago? Or a recent discovery of a new gadget? This is so cute! It always feels like a complete triumph to squeeze a garment out of a small piece of fabric! For me, my favorite foot has to be my 1/8" compensating foot... it makes my topstitching perfect! Woo I'm off to check on what a 1/8 compensating foot is! Thanks for the tip! I got my walking foot about 6 months ago and I can't believe how I lived without it. I thought it was only for quilters (I had just started quilting), but when I used it for garments, MIND BLOWN! I really should try more feet. Yes a walking foot is fab, isn't it! Hope you are enjoying your new quilting adventures! Lovely. Love the new blog name and cards. Fab. Thank you for your kind words, as always! I ought to try more feet, I have several it's just a matter of using them. . . I love to finish with bias tape -- so much quicker than a facing. Very pretty top! Thank you for stopping by, and also your kind words. Regarding the sizing on the dart -- I believe these are the sizes of the finished garments. There is a big difference between the ones on the envelop and these due to both "design ease" (i.e. is it designed to be a tightly fitted or loosely fitted top?) and "wearing ease" (for comfort, so you will always need some of this even if the design ease is minimal). To answer your question, I would stick with the size 14 dart, and don't let the sizes next to the dart confuse you. 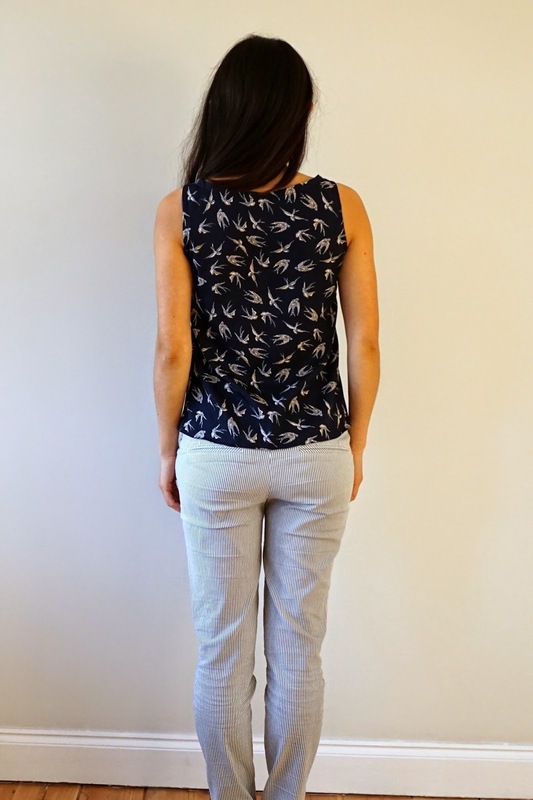 However, do measure round (and perhaps measure some of your ready to wear tops) to see whether the size of the finished garment for size 14 might fit you. I hope this helps and sorry for rambling on! Good luck with your top! Looking forward to seeing your version! Im with you on the walking foot. It's been the default in my machine since I got it. The other thing I love is the straight stitch cover plate. I got a machine from the 70's and was amazed at how much better it made my straight stitch. I didnt even know they existed until I got an older machine! 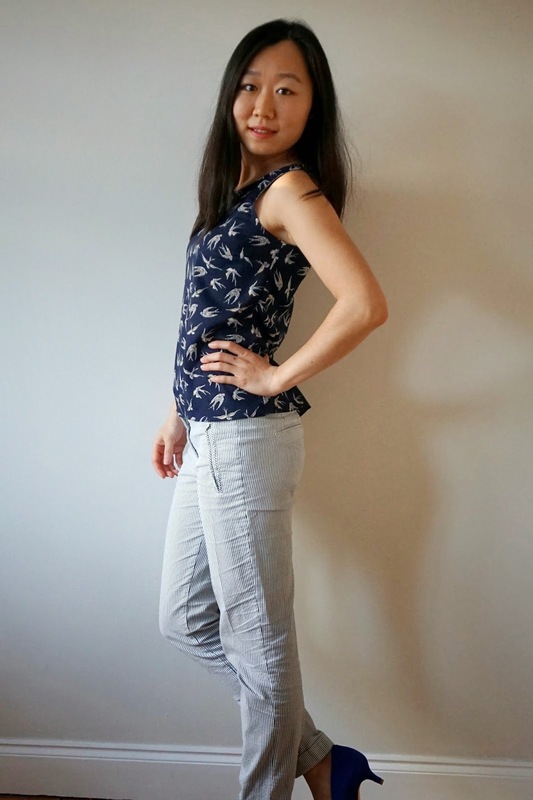 Love your blog, came here from burdastyle, upon checking the construction of the neckline in the pattern instructions, I knew I wanted to do different... thanks for the clear explanation and pictures. New name and domain for the new year!